Photo courtesy of Saranna W.
Although conception had been complicated with their first pregnancy, they were delighted that Saranna got pregnant more easily this time - though Saranna remembers that the giddiness she felt was intertwined with fear of losing another baby. With a cerclage at 14 weeks to address the cervical insufficiency that had prematurely ended her first pregnancy, this second pregnancy was otherwise healthy and uneventful - until a nasty virus intervened during Saranna’s third trimester. She was able to wonder at the sight, but she wasn’t yet able to hold her baby. Neha was taken for some medical tests, and Saranna was moved from the operating theatre to a recovery room. Marked by her experience of having lost her first baby, her anxiety mounted as the separation went on. Finally Saranna’s birth doula advocated for the family, saying, “Saranna needs to hold her baby - the baby needs to be held.” When she was finally able to hold Neha, Saranna felt a tangible sense of reassurance - this *was* her baby, and the baby was healthy. For Saranna, bonding with Neah really started after the first 24 hours, as a massive dose of antibiotics began to vanquish her virus symptoms and she was able to use her body to be active and interactive with her baby. “She was so little - I was so scared I was going to break her,” Saranna says, a feeling common to many new parents but intensified by the trauma and loss she’d experienced in birthing Spencer. Coming home from the hospital, Saranna and Frank experienced a week of chaos as they settled into their new reality, and then another week of digging out from under that chaos. Neha had severe reflux, and navigating the medical system to find the right solution added another couple of weeks of disequilibrium. Meanwhile, conflict escalated with Saranna’s family, resulting in a decisive separation from her parents. “It took a while to get into a rhythm, but once we did, we did well,” Saranna says. And soon they felt ready to add to their family again. The experience of having had a healthy baby was redemptive, and there was more a sense of possibility as they tried again to get pregnant. The process, Saranna says, was “more fun this time.” When she became pregnant again, there was still some fear born of loss, but in some ways, the path felt well-trodden - she got set-up with the high-risk team again, and while there were some early moments of concern, those soon resolved. Her 3rd pregnancy was her least eventful. The birth of baby Mira was redemptive in some ways as well - the team of female doctors and nurses listened intently, respected her priorities (especially getting to hold Mira right away), and validated the ways in which her previous birth experiences had been damaging to her. Mira was hearty, and they were able to leave the hospital without NICU intervention - to their intense gratitude. Saranna was relieved to get home to Neha, who’d been with a patchwork of care providers during the hospital stay. This time, their homecoming - and the experience of settling into life with a new baby - was eased by postpartum doula support. The birth doula who’d supported Saranna and Frank in both girls’ deliveries had referred them to Bridgetown Baby, and they’d met with Merriah and Emily during Saranna’s pregnancy to plan for the postpartum period. From a rough start in life, through the pain of losing her son, Saranna has emerged with a clear sense of the legacy she and Frank are building for their children. “We envision our kids as adults around this table, sharing memories of their parents with their own kids. We’re building a legacy of connection.” And that connection is obvious in the calm, deliberate and loving interactions between Saranna, Frank and their rambunctious girls. If you are seeking support as you navigate the grief of pregnancy loss or the loss of an infant, we invite you to start with a short list of resources on our blog. If you’re embarking on pregnancy, and wish to seek out information to help you plan for and support a healthy pregnancy, please contact us for resources from our extensive list of local referrals. Saranna's Story, Part 1: Pregnancy Loss - Will There Be Joy Again? For Saranna, family was something that didn’t come easily. At 8 weeks old, she made the long journey from an orphanage in Calcutta to an adoptive family in Oregon. Once here, she worked to overcome serious medical conditions, while contending with difficult dynamics within her adoptive family that would leave her estranged from her parents as an adult. When she and her husband Frank married in 2007, they were eager to start a family. “It was like the puzzle pieces were all in place, and we could start to make our dreams of having a family of our own come true,” says Saranna. As hopeful as the prospect of building their family was, this hopefulness was tempered by the challenges they encountered in becoming pregnant. It took support from members of their church community to puzzle through the maze of the medical system, then a panoply of medical and alternative interventions, to finally get pregnant in the early spring of 2012. As Saranna and Frank celebrated the joy and anticipation of her pregnancy, Saranna was also careful to follow her doctor’s guidance to a T, with special attention to managing the impacts that the pregnancy had on her ongoing medical conditions. It took a few months, Saranna says, to get back to “her normal.” And then, when she did, things went quietly sideways. In week 19 of her pregnancy, things started to feel “off.” She shook it off, convincing herself that it could be anything, that it certainly wasn’t something serious. “I didn’t listen to my intuition,” she now says. On a late Friday afternoon, as she headed out on a round of errands to stock the nursery, her water broke. She and Frank rushed to the hospital, where she would learn, in the words of the attending doctor, “you’re perfectly healthy...but your pregnancy isn’t.” There was no way to save the tiny being inside of her. In a swirl of shock, grief, medical decisions to be made, and hospital paperwork, she spent a sleepless night trying to come to terms with the procedure scheduled for the next morning that would end her pregnancy. “I felt these mama instincts to ‘keep my baby safe, here in this bed,’” Saranna says, describing the irrational desire she felt for time to stand still, for the night not to end. The early hours of the morning brought a peace and a readiness to let her baby go. When the procedure had been done, she could finally learn whether the baby had been a boy or a girl; the magnitude of the loss sunk in when Frank said, “it was a little boy.” Their son, Spencer. Bundled out of the hospital, without ceremony, she and Frank were sent home to grieve and figure out how to go forward. The next day was Father’s Day, and the seasons that followed were seasons of numbness for Saranna. She put her grief on hold, going through the motions of daily life, marriage, community, taking care of everyone but herself. “Grief is a lonely place,” Saranna says, looking back on that time as a season of missed connections. She and Frank grieved their loss separately; she didn’t have a relationship with her parents that provided warmth and support; and her grief isolated her from the church community that had been a pillar of strength for them. As she sought to understand the medical explanation for what had happened, Saranna also sought out local resources to support her grieving process, but, she says, “the support groups I found didn’t feel welcoming to me, as a person of color with an obvious disability.” She spent hours combing the internet for articles and stories that would validate her experience. She found some small rituals that helped her to cope. The warmth and loyalty of their dog, Mocha, was a sanity-saver and a source of comfort. There’s no such thing as a simple happy ending, and though sweetly humorous, the anecdote above is also revelatory of the complexity of pregnancy, and parenting, after loss: fear of losing her second baby rimmed her emotional experience of the pregnancy; not a day goes by that she doesn’t miss the son she never knew; some of the cloud of numbness she felt in 2012 has only recently started to lift. But you only have to meet Saranna to sense the joy that she finds in her growing family. In the second installation of Saranna’s story, Bridgetown Baby joins the team that has supported Saranna and Frank through the challenge and redemption of continuing to build their family - read more on Bridgetown Baby’s blog, coming soon. October is National Pregnancy and Infant Loss Awareness month. We stand with the families, in our Bridgetown Baby community and around the world, who have lost a child - and we want you to know that you are not alone. If you are seeking support as you navigate this particular grief, we invite you to start with a short list of resources, on our blog. Photo courtesy of Ben B. 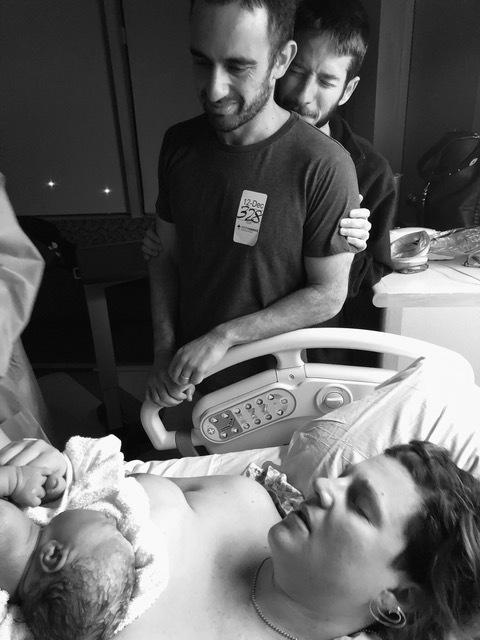 For Ben and his wife Lauren, the path from their son’s birth in January, 2017 to Father’s Day, 2017 was a rocky road marked by medical trauma, parenting challenges, emotional struggles, and, finally, healing. Ben recalls that first Father’s Day as the time when things started to normalize and they began to enjoy the kind of family moments he’d expected from the start. It was while on the operating table for a routine c-section that everything went sideways. Once the baby was delivered, Lauren started bleeding profusely. Ben was rushed out of the operating room while the surgeons scrambled to stanch the bleeding. He spent 15-30 minutes in an adjacent room, not knowing if Lauren would live or die. “It was the most profound loneliness I’ve ever experienced,” Ben says of those moments. Once the hemorrhage was under control, Ben spent the next three days at Lauren’s side in the intensive care unit, focused wholly on her survival. No part of the story of their first three days as parents is about meeting their son, looking into his eyes, counting fingers and toes, and marveling at his tiny perfection. The baby, who would be named Sully, entered the picture only on day four, when their doctor had to push for an exception to the rules to allow Sully into the ICU to meet his mother. Ben, Lauren, and Sully headed home from the hospital not long after, to settle into their new life as a family of three. But, “the course of what I thought parenthood was going to be was completely altered,” says Ben. Medical struggles, ongoing physical impacts from Lauren’s hemorrhage, severe colic, and the emotional fallout from their trauma consumed them for the next four months. 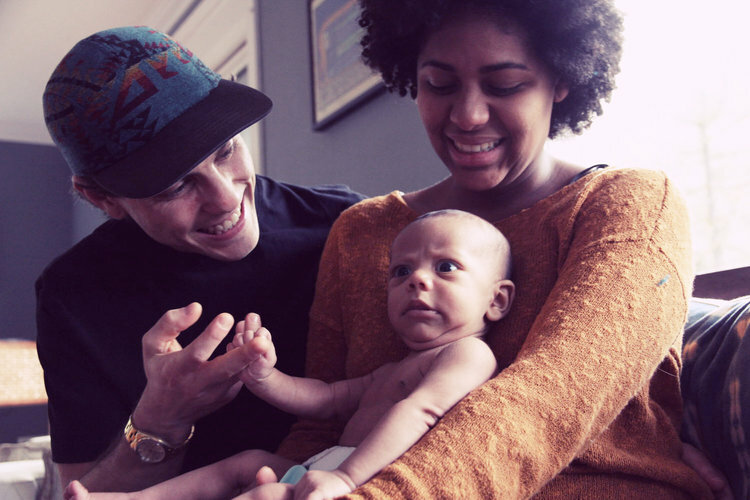 Lauren experienced a bout of postpartum depression; Ben focused on supporting her through that. As she began to resurface, he took a dive into depression, anxiety, and PTSD. During those months, Ben lived in a swirl of fear (“Would things ever be normal again? What if this was a mistake and we never reclaim our identity? What if we never get to surf or travel or do the things we love?”) and anger (“why us?”). “It honestly took 8 months to…I won’t say ‘recover’… but to get back to neutral,” Ben says. What helped? A flood of family and friend support; research into paternal postpartum experience, PTSD, and trauma recovery; an awareness, shared with Lauren, about the need to heal; a subsequent therapy journey. And, support from Bridgetown Baby. With the perspective he’s gained, Ben now feels a drive to share the struggle he went through: if his experience can make it just one or two clicks easier for someone else to find the resources they need, he feels it’s worth telling his story. Find more information on the Bridgetown Baby blog about dads' varying experiences, including tips and resources to make your job as a dad easier and more fun! Becoming a mother after two decades of caring for infants, small children, and families has been an interesting process. While I was pregnant the speculation around how easy the transition would be groomed me to smile politely as anxiety bubbled within me. Yet even with 20 years of practice under my belt I felt like a complete amateur when they handed me Maverick for the first time. As I fumbled with hospital sheets and a starchy swaddled newborn I realized instantly that no amount of prior exposure could have prepared me for the feeling of holding my son. That bundle of life was one of my greatest accomplishments. I had grown him from two cells and carried him within me for 40 plus weeks. As my husband, Andy, and I examined his every inch we caught each other settling into the awareness that Maverick was going to be an adventure of a lifetime and we were only at the beginning. When we were released from the hospital I took an eternity buckling the baby into the car seat. I was having trouble securing the straps. My muscle memory was being overridden by my new title of “mother”. Buckle the 5 point harness. Pull the strap. Slide up the chest clasp. Check for two fingers of give. Nope. I did that wrong. Was I supposed to tighten then adjust? Or adjust then tighten? Was the chest fastener too high? What is a sternum again? Check. Double check. Redo. Check again. Looking back on our process of choosing a doula, I am so thankful for my husband’s astute articulation of what we (read: I) needed. We were in search of someone who would doula me so I wouldn’t doula myself. As we victoriously reach one month of parenthood I am able to reflect on how grateful I am for the loving support of the Bridgetown Baby team. Our son is getting to know us as our best selves. We get to spend time revelling in the nuances of this child. We are becoming experts on all things Maverick. Welcoming in our postpartum doulas has meant we get to focus on the important emotional bonding without having to compromise our everyday routines (showering, eating, hydrating, sleeping) while ensuring that all three of us are getting care and support as we learn, as a family, what works best for meeting our needs and goals. It’s been an amazing transition. And I’m happy to say that now my muscle memory kicks in even when my mommy-brain can’t fully comprehend why there is so much fabric in the Moby wrap! C.V.’s Story: Double Twins Dad! Stay-at-home dad C.V. already had 4-year-old twins (the bigs) when his second set of twins, boys Carlyle and Sebastian (the littles), were born in fall of 2015. He had forgotten what it was like to have two babies at once, but reality hit full force those first few months. And this time, the infants’ round-the-clock needs were compounded by having two other young children. Overnight, life turned into an endless rotation of diapering, swaddling, feeding, sleeping and bottle-washing. Competing with these demands were C.V.’s older children, who needed to be fed, entertained, bathed and parented. The sleep deprivation was brutal. The mental exhaustion was punishing. C.V. knew he and his wife, Stacy, needed help. Stacy’s friend referred them to Bridgetown Baby, and a Go Fund Me account helped them purchase 36 overnights over a six-month period. The help, in the form of postpartum doulas Merriah Fairchild and Emily Darley Hill, brought a measure of sanity back to the household. The North Portland father says although well-meaning family and friends tried to help, the complex feeding system and efforts to sync the twins’ feeding and napping schedules was difficult to navigate. But when he explained everything to Bridgetown Baby’s doulas, they not only got it, they helped him achieve his goals with professional guidance and seamless care. What would he tell other parents about to welcome twins into their families? Having a baby surrounded by parents, in-laws and friends is … still hard. Having a baby in a city you just moved to, with few friends and no family around is … overwhelming, isolating and feels impossible. That’s where Maggie H. found herself just before Thanksgiving 2015, as she ushered her first baby, Kaia, into the world, just 10 months after moving to Portland from Brooklyn, New York. Her parents live in California, and her husband Peter’s parents live in Philadelphia. Peter’s parents suggested a night nurse. Maggie, a self-described “tough midwestern girl,” says she resisted the idea. But five days after returning home from the hospital, she relented. Through word-of-mouth, Peter found Bridgetown Baby. Mercifully, Maggie says, they sent postpartum doula Emily Darley Hill over that night. The relationship extended for four months of periodic overnights. Emily and Merriah helped Maggie learn how to breastfeed Kaia despite her sore abdomen. Maggie also learned how to swaddle her new daughter and wear her in a sling. She went from getting one hour of sleep at a time to four. The doulas did laundry, cleaned and engaged in a friendly competition of who could bake the best chocolate chip cookies. Now the family has a broader support system and “mama network,” but at the time, Maggie says Bridgetown Baby was a lifesaver.